HOMESTEAD, Fla. – Biscayne National Park is home to a number of different ecosystems, making the park a safe haven for a variety of different animals and wildlife throughout South Florida. Of these many ecosystems, the park has an established history with mangroves. Along the western edge of the park, one of the longest stretches of mangrove forests on Florida’s East Coast extends continuously for miles. 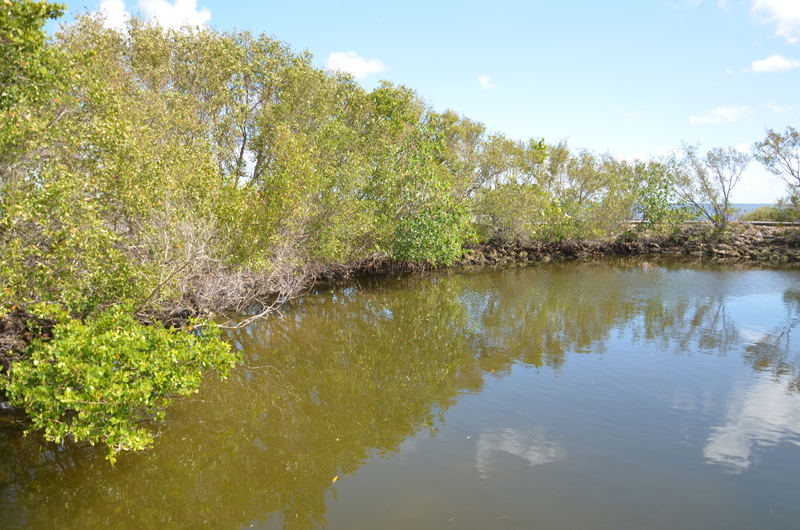 Mangroves grow along the Dante Fascell Visitor Center shoreline at Biscayne National Park (Staff Photo). Mangroves can be best described as a collection of trees in tropical areas that typically have numerous thick, tangled roots. The reason they are considered to be of utmost importance to the ecosystem of South Florida is they play a dual role in an ecological and physical sense. These forests that stretch across the park are home to a number of bird, reptile, amphibian and mammal species while also performing numerous ecological functions. They preserve water quality as they have the ability to grow where no other tree can while also reducing pollution. Being that South Florida is an area vulnerable to hurricanes and other tropical storms, mangroves also play a vital role in protecting the mainland during catastrophic events. Their thick, deep-seated roots protect the mainland from the crashing waters during a disaster. With climate change becoming such a volatile discussion in contemporary society, the effect mangroves have on the atmosphere should not be diminished. 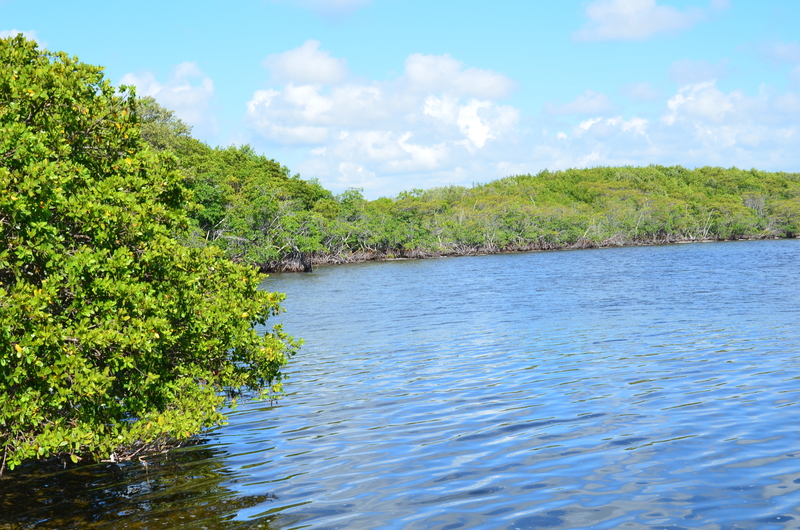 Biscayne National Park is home to three different classifications of mangroves, those being red, black and white mangroves. These mangroves differ in their location to the shoreline, however they mostly serve the same roles in their ecological and physical functions. Mangroves line the coast as to prevent shoreline erosion and shield inland areas from hurricanes and other natural calamities (Staff Photo). Despite the many positive functions mangroves have proven to provide, as the issue of climate change continues to grow in contemporary society so do the potentially negative consequences on mangroves. Because of their location along the coast, mangroves are susceptible to damage during development projects. While their thick roots make them nearly impervious to destruction, extreme forces such as development of hotels or private residence have destroyed some of these ecosystems. Other man-made destruction such as oil spills, chemical pollution and sediment overload have an adverse effect on mangroves. The issue of rising sea levels in Miami will also be a factor in their future. As veteran Ranger Gary Bremen explained, Florida is unique as its hardened sea walls could lead to the destruction of mangroves. “As the red mangroves move in, so do the white and the black … eventually there is no place to go,” he stated. Because of their location, the red mangroves will continue to push the white mangroves closer to the shore, while the white have the same effect on the black mangroves. Due to Florida’s hardened walls, once they are pushed to a certain point the mangroves are destroyed as they can no longer move up the coast. Although the park leaves their waters open to fishermen, many take for granted the grave consequences the destruction of mangroves could have on their beloved activity. Myles Hayes, a visitor to the park, related the sentiment I felt many around South Florida would have. “When I think of climate change, the effect on mangroves is not something that comes to mind,” Hayes said. Most people are, in fact, like Hayes. When most think of climate change they think about it in a broad sense, not the ripple effect it has in almost every walk of life. The destruction of mangroves would come with the destruction of an important ecosystem that many different species of fish in Biscayne’s waters call home. Depending on how dire the situation becomes, these fish would either migrate to different areas, die out or evolve to live in a different habitat. According to Bremen, one of the issues with climate change is the only way the park can bring about change is through education. This large topic in society will change if voters come out and voice their opinions about this large matter in question, as it is more of a political discussion than anything else. To ensure that education of these issues is taking place, Biscayne National Park hosted the opening of the art exhibit, “Piecing Together A Changing Planet” from Dec. 5, 2014, through Feb. 27, 2015. The Studio Art Quilt Associates, an international non-profit organization dedicated to promoting the art quilt and the artists who create them, produced this exhibit. For “Piecing Together A Changing Planet,” artists created a variety of quilts using different textile techniques. Some of the issues that are highlighted through these quilts are rising sea levels, the melting of polar ice caps and other natural calamities that have started to occur at a more rapid pace. Artists are often catalysts for change when it comes to climate change. By mixing a form of entertainment with real-world issues, they are able to create awareness and highlight issues that are taking place in society. 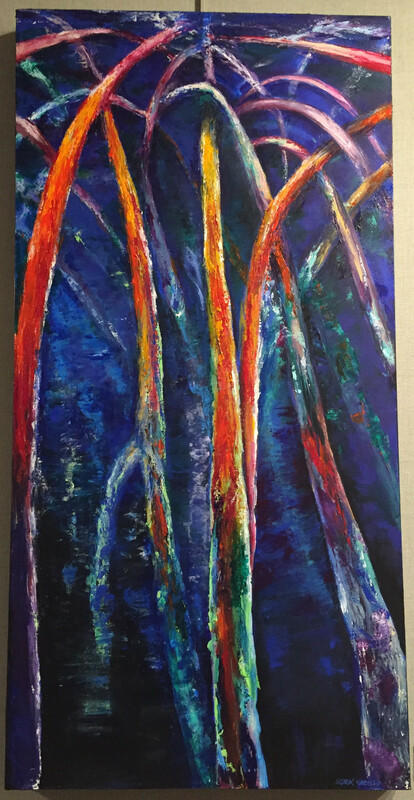 Palette knife painting by Ana Sora Vadillo highlights the beauty of mangroves (Photo by John Rioux). 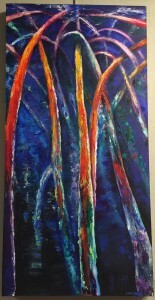 While this exhibit was not focused on climate change, the artists used a certain technique called palette knife painting to accentuate the beauty of mangroves. Mangroves are also aesthetically pleasing ecosystems that add a great deal of pleasure to those who enjoy walking around the park for its natural beauty. While it is easy to put the onus on somebody else to force change on the multitude of climate issues, it is all of us as human beings who have the opportunity to do something about it. The water portion of Biscayne National Park is open 24 hours a day. Adams Key (accessible only by boat) is a day use area only. The Dante Fascell Visitor Center is open daily from 9 a.m. to 5 p.m. during the winter season (November through April) and from 10 a.m. to 5 p.m. during the summer season (May through October). The visitor center is closed on Thanksgiving, Christmas and January 1st. Biscayne National Park does not have an entry fee, however there is a $25 camping fee required for each overnight stay in either Elliott Key or Boca Chita Key harbors. If you have any interest in seeing the “Piecing Together A Changing Planet” exhibit for yourself, visit NationalParkExhibit.com to view the travel schedule of different parks that are displaying the work.